Go and do that and then maybe the society you live in will take you seriously. That’s how daft these fake Christians are. Despite allegations of sexual misconduct against Senate candidate Roy Moore, many pastors in Alabama and other states in the Southeast are sticking by the twice-removed Chief Justice. Read the rest. And then ask yourself how miserable the congregations of these fake Christian preachers must be to put up with their ignorance and grotesque stupidity. Or you’ll just look silly. In 2017 people who knew nothing about the #Reformation except the broadest mythic generalities became ‘experts’ and published studies and news articles. Most of which are travesties. The video shows the decorated World War II veteran calling for help six times before he goes unconscious while gasping for air. An 11Alive investigation uncovered hidden camera video catching nursing home staff laughing while an elderly patient dies in front of them. The incident happened at the Northeast Atlanta Health and Rehabilitation in 2014, but the video was recently released as part of a lawsuit filed by the family. Attorneys representing the Atlanta nursing home tried to prevent 11Alive from obtaining the video. They asked a DeKalb County judge to keep the video sealed and then attempted to appeal to the Georgia State Supreme Court. The judge ruled in favor of 11Alive and the nursing home eventually dropped its appeal to the state’s highest court. About times and dates, brothers, there is no need to write to you for you are well aware in any case that the Day of the Lord is going to come like a thief in the night. It is when people are saying, ‘How quiet and peaceful it is’ that sudden destruction falls on them, as suddenly as labour pains come on a pregnant woman; and there is no escape. But you, brothers, do not live in the dark, that the Day should take you unawares like a thief. No, you are all children of light and children of the day: we do not belong to the night or to darkness, so we should not go on sleeping, as everyone else does, but stay wide awake and sober. Night is the time for sleepers to sleep and night the time for drunkards to be drunk, but we belong to the day and we should be sober; let us put on faith and love for a breastplate, and the hope of salvation for a helmet. God destined us not for his retribution, but to win salvation through our Lord Jesus Christ, who died for us so that, awake or asleep, we should still live united to him. So give encouragement to each other, and keep strengthening one another, as you do already (1 Thess. 5:1-11). A disturbing pattern has emerged since the Washington Post first reported that four women accused Republican Senate candidate Roy Moore of offenses ranging from the creepy to the criminal. People in Gadsden, Alabama, where Moore worked in the District Attorney’s office three decades ago, say it was “common knowledge” that Moore pursued teenagers when he was in his 30s. Locals told the New Yorker that they recall being told than the local mall banned Moore for the same reason. Accusations of criminal assault are difficult to prove in court and the statute of limitations in these cases has since passed. But Republicans outside of Alabama have started to back away from Moore following the allegations; They have chosen to believe the accusers. This is not Christianity. Rather, it is an extreme Republican religionism that stands by party and regressive policy no matter what. It’s not the gospel of Christ, but a gospel of greed. It is the religion of racism and lies, not the religion of redemption and love. It is unlikely that any of Moore’s accusers can definitively prove that he sexually assaulted them 30 years ago (a point the defiant former judge knows well). But even before these allegations made national headlines, it was clear that Moore’s policy agenda endangered the children of Alabama and this nation. This man, who wants to be Alabama’s next Senator, wants to repeal Obamacare, making it health care inaccessible for millions, in Alabama and elsewhere. He has said Islam is a “false religion” homosexual conduct “should be illegal.” and curtail equal protection under the law for gay and transgender people. Moore supports a tax plan that would hurt the poor and working poor. Police say a three-month-old baby whose mother dangled him over a balcony at apartment complex in Knoxville died from his injuries. His mother, 19-year-old Tierra Patrice Williamson now faces first degree murder charges in his death. The call came in around 8:20 p.m. Friday to an apartment complex at 1100 Lula Powell Drive. A 911 caller said the woman was threatening to drop the child, Adrian Prince Howell, Jr. from a third-floor balcony. When police arrived, they found the injured child inside the apartment. He was rushed to the hospital, where he later died. Police say the cause of death was blunt force trama to the head. Williamson is still being treated at the hospital under guard. Once she is released from the hospital, she will be taken to the Roger D. Wilson Detention Center where she will be hold on $100,000 bond. 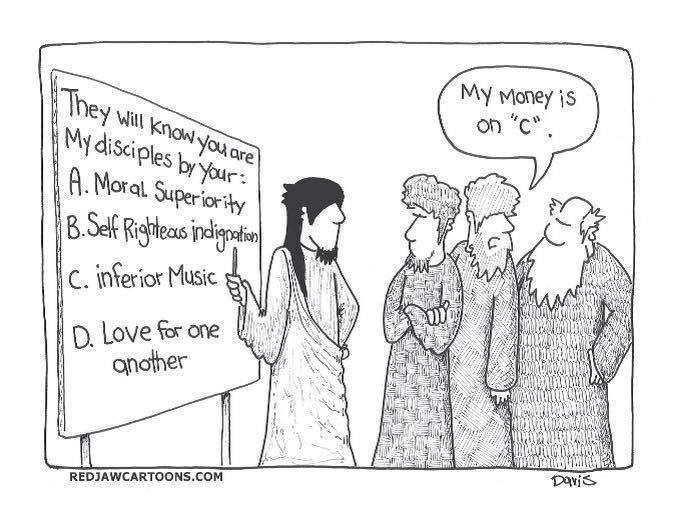 Well, since A and B aren’t even options for most Christians these days… I’m gonna go with C too. With thanks to Adam North for sharing it. This is an eye opening essay about a man who can best be described as a lifelong liar. No one should be surprised to see fake Christians exposed for the weeds they are. It is inevitable. But no one should blame the authentic for the frauds either. They aren’t the product of the Church, they are the product of the Enemy.